David Fox was nominated for the 2014 Wedding Industry Awards Roll of Honour. 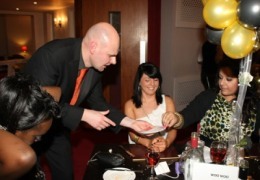 This is testimony to his professionalism, experience and dedication in ensuring he delivers a world class performance of magic on your special day in Leamington. Indeed, the town and its immediate environs boast some of the finest wedding venues in Warwickshire. Locations such as the Angel Hotel on Regent Street and Mallory Court on Harbury Lane. Ideal times for a magician of David's expertise to perform are during the drinks reception and photographs, or throughout the period from the end of the wedding breakfast to the first dance. 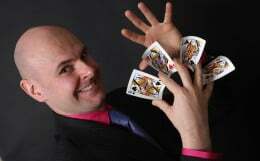 David Fox can freely mingle with your guests whilst amazing them with unbelievable performances of card magic, illusions, mind-reading effects and devastating sleight-of-hand too. 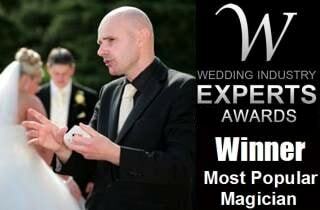 However, every wedding day is unique and Magic Circle magician David Fox will provide you with a customised magical package for your special day. He is always delighted to discuss your own unique requirements and will liaise with the events team at the venue in and around Royal Leamington Spa.